The blockchain technology is set to rule the BFSI sector. The retail sector eyes on VR and AR technologies to bring interactive apps for the customers. The manufacturing sector is getting ready to leverage the IoT benefits. What do these trends indicate? Well, various industry sectors are ready to embrace the evolving technologies to serve their customers in a better way, grow their sales, and stand firm amid intensifying competition. Interestingly, various aspects of all these technologies can be integrated into mobile app development services. This integration helps developers to come up with innovative and customized app solutions. But then, the mobile app developers should have skills to integrate the cutting-edge technologies. There, the need to remain updated with the new technology arises. Let’s go through six compelling reasons to embrace the futuristic technologies. Today, a mobile app can serve many purposes and assist the users to perform various tasks throughout the day. Entrepreneurs also jump on the mobile app development bandwagon to get the benefits of the mobile app’s growing popularity. As a result, we come across many business apps across various industry sectors. Now, comes the twist. 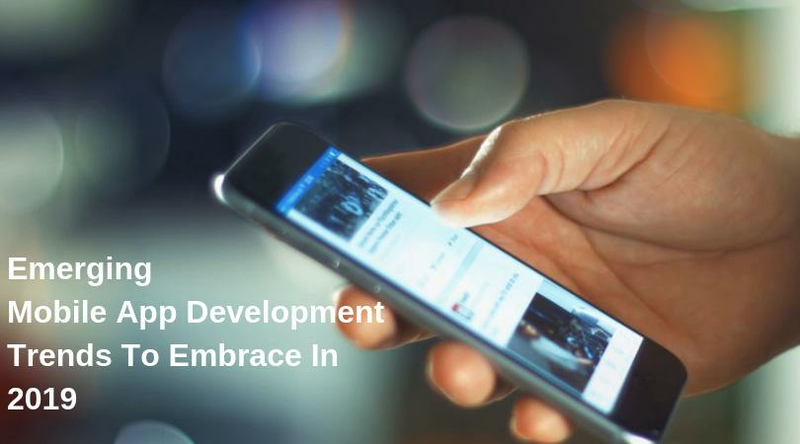 The business mobile apps are robust enough to handle the complex business processes, but when it comes to meet the end user’s needs, the mobile app developers need to pay more attention. For example, people want rapid transaction in a secure way on the move. The blockchain technology can address this requirement with data encryption. The mobile app developers with the knowledge of blockchain can make the enterprise mobile app more secure for the online transaction. These days, every company, irrespective of size and business model, has to deal with growing competition. If one company comes up with an app, its rival company also brings an app with even more or better features. The mobile app developers need to remain well-versed with the evolving technology to come up with more innovative and feature-rich apps every time. When the company assigns them an app project, they should show an insight to integrate high-end features and functionality. Such insight can help developers win the client’s trust and boost their confidence. Let’s take the example of a retail sector. The online retailers and eCommerce business providers want to facilitate their customers to try clothes or experience things in the comfort of their homes. Their, various features of AR and VR technologies can be used. Another example is of the mobile wallet. If companies want to include the mobile wallet feature in their business app, developers should be able to do so in a short time. In other words, the mobile app developers should be capable of meeting the requirements of enterprises across various industry sectors, and therefore, they need to remain updated with the emerging technologies. Both Google Play and Apple App Store have stringent standards for accepting the app. The software giants also bring big changes to them on a regular basis. In such a situation, it is necessary for the app developers to build apps that do not face rejection. There, advancing technology can lend a helping hand if the developers know how to integrate advancements smartly and innovatively while meeting the app standards. For example, both Google and Apple have introduced the AR-based app development kit to leverage the benefits of AR technology. In the coming years, we will witness more AR and VR-based app in the app stores. It will prompt the companies to set new standards and the app developers need to know how they can remain compliant with the standards. Do you know technology can help app developers meet deadlines? The mobile app development process revolves around on-time project completion. It is necessary for the company to build a good reputation in the market. The happy client can spread a good word for the company and as a result, the app development company can get repeat business and new clients. Technology can play a vital role in meeting deadlines. Various innovative features can be readily integrated into the app thanks to the interrelation of technologies. For example, the IoT devices can be controlled easily through a custom mobile app solution. The developers can integrate data analytics in the app to analyze the valuable data gathered by IoT devices. Also, the AR technology can help developers to add feature related to device info and location for the app users. In a way, various technologies combine to provide an improved user experience. What’s more, such technologies help app development companies to build desired features in a short time. 12 million mobile app developers and counting… The number of qualified mobile app developers keeps on increasing worldwide. In such a competitive scenario, the app developers must remain updated with the latest technology to stay ahead of the curve. It is fair to mention that the mobile app developers who fail to go with the flow may not get much work in the future. In other words, it will be very important to stay updated and relevant in the coming years for the mobile app developers globally. That’s it for now. Here we have covered the most noteworthy reasons for the app developers to stay updated with a thriving technology. When companies hire dedicated app developers, they always consider the knowledge of the latest technology and market trends. These points are sufficient to show the importance of staying informed. While developing a custom mobile app solution, the mobile app developers have to focus on addressing the end users’ problems. Technological advancements can help them achieve this objective. Emerging technologies including IoT, AR, and VR have capabilities to meet the requirements of modern businesses and tech-savvy users. If the developers stay updated with these concepts, they can come up with innovative app solutions. We provide the best-in-class mobile app development services to the corporate clients. Companies can hire dedicated mobile app developers to get the next-gen app solutions.